This Feiss Bennie 1 light LED small outdoor wall lantern in painted brushed steel finish with water glass panels and rated IP44 is contemporary and elegant. Rectangular wall mount and curved rippled water glass fascia, with integrated 14w LED module tucked into the roof, which shines down through the water glass creating a lovely effect. The Bennie collection of contemporary outdoor wall lights boasts an integrated LED module tucked into the crown of the fixture, shining light downward through a clear water glass shade. Available in either warm antique bronze or a more modern painted brushed steel finish and the cast aluminium construction ensures durability. There is a matching large LED lantern available in the painted brushed steel Bennie range, please scroll down this page to view and also available finished in antique bronze. This exterior light is supplied by Elstead Lighting and designed in the USA by Feiss, founded in New York in 1955. 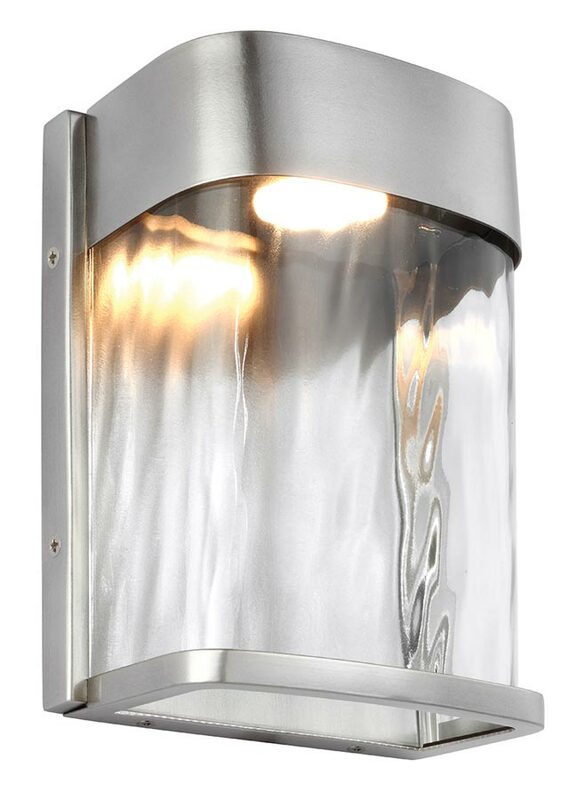 They have become well known over the years for their contemporary yet classic styling, quality and great original designs like the Bennie 1 light LED small outdoor wall lantern in painted brushed steel finish with water glass panels and rated IP44 you see here.